A couple of weeks ago, my husband and I were out exploring at our place up in the Catskills. Buried under the leaves in the dirt, we found fragments of old cups and plates. They were so interesting, and some so beautiful, that I brought in some of the pieces to see if I could trace their origins. Today I pulled out one of the large plate pieces to sketch. I used Prismacolor pencils, which turned out to be a great choice in this 5.5x8.5" Stillman & Birn Epsilon book. The smooth surface proved perfect for colored pencil work. Well, y'all know me by now, and it wasn't long before I was noticing that I had both old Berol Prismacolors and new Sanford Prismas. I had to do some color swatch tests too while I was at it to see if they were really the same. It turned out that of the ones I sampled, only the Marine Green was significantly different, with the Sanford having a more yellow-green appearance when compared to the more muted green of the Berol. I compared them dry as well as washed with a bit of Turpenoid on a Q tip. The green ink is Noodler's Sequoia --- one of my favorites for ink and wash. "Bits 'N Pieces" was written with Noodler's Bulletproof Black in an Eversharp Symphony Flex fountain pen with a Fine nib. I know I promised some comparisons of black inks, but I've faced some unforeseen circumstances with this snowstorm in the Northeastern US. The images of the results from those tests are on my desktop computer, so I'll have to wait until our house has power back before I can post them. We really got pounded! I did the sketch above when I pulled out the candles today. You can click to read the text; it should enlarge enough to be fairly easy to read. 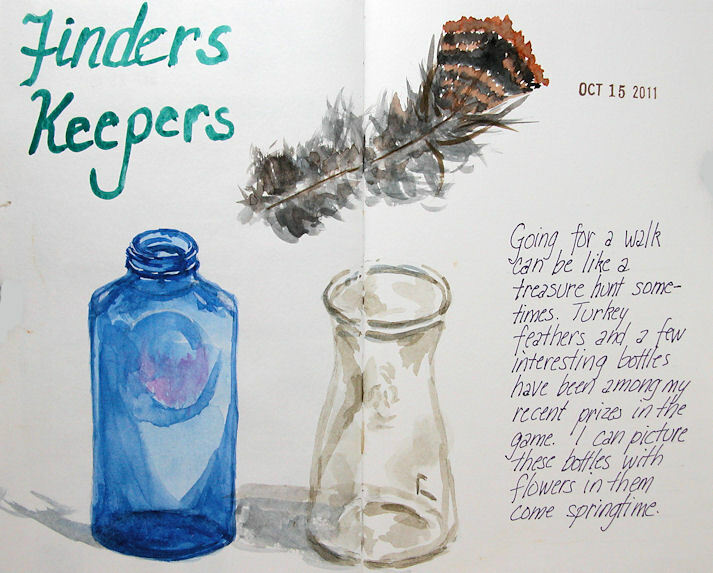 I test drove some new things in this sketch, like the new Noodler's #41 Brown (2012) that I reviewed the other day. 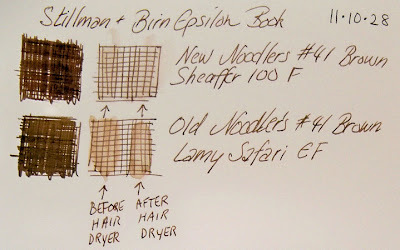 In using it with watercolors, it didn't run at all on this Stillman & Birn Alpha paper, even though on the test I was able to get it to move a bit with hard scrubbing. I also used one of my new Eversharp Symphony flex pens (this one with a B nib). After much practice by candlelight last night, I was finally able to better understand how to use these things. 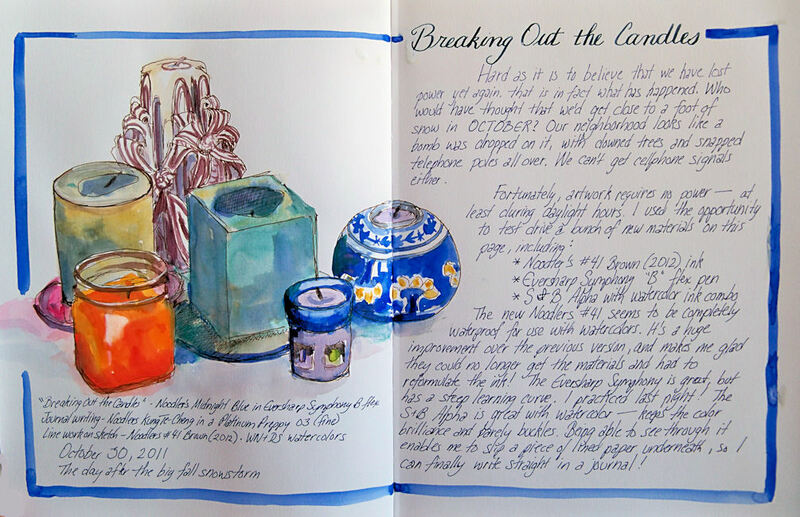 The title "Breaking Out the Candles" was written with that pen, using Noodler's Midnight ink. 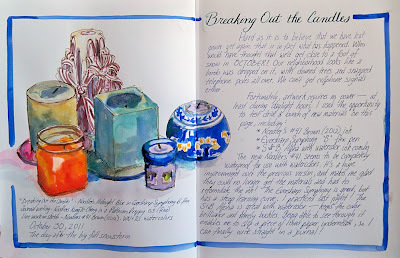 I also have to say, this Stillman and Birn Alpha book totally rocks! I will give more of a full scale review once I've done some more work in it. Initially I thought the paper wasn't opaque enough for me, but today I realized the silver lining of that feature; I can slip a piece of lined paper behind the sketch to keep my writing straight! I'm also loving this 8.5x11" size. Usually I'm sketching out on location and don't want to bring along such a large book, but having that 11x17" space to spread out across two pages is a wonderful thing. It opens fairly flat, so it's quite easy to work across the gutter, which can be a challenge in some stitchbound/hardbound sketchbooks. The journal writing on the page was done with Noodler's Kung Te-Cheng, one of my favorite writing inks, and it's completely waterproof to boot. As many of you may know, Nathan (owner of Noodler's Ink Company) has been unable to continue making his popular #41 Brown. 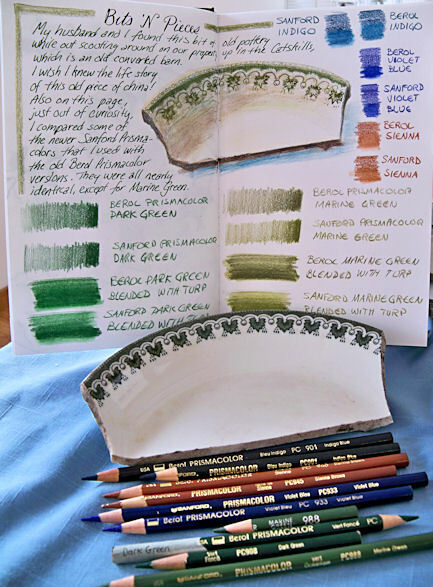 Artists, calligraphers, and fountain pen aficionados have all been wondering how they're going to continue to satisfy their addictions for a favorite color. 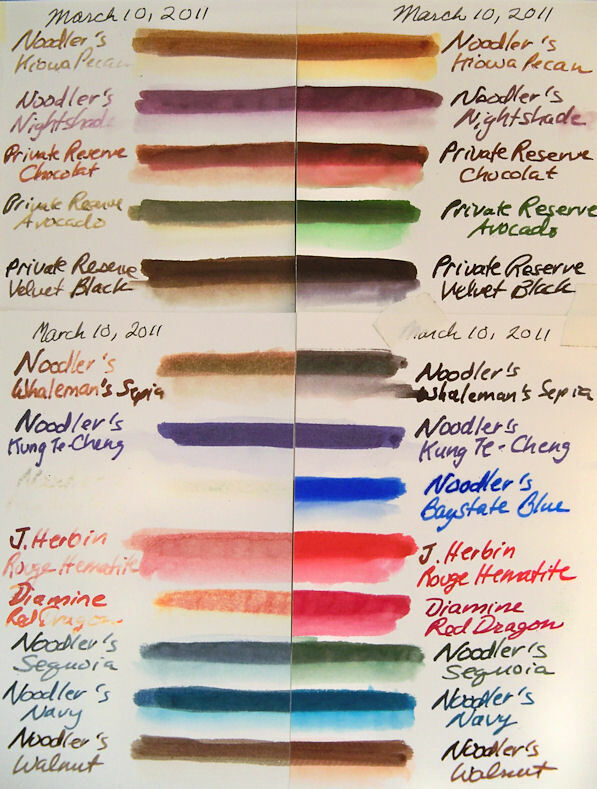 Nathan reformulated the ink with different ingredients, and it is now available, bottled as Noodlers #41 (2012). I just received a sample of it, and did some comparisons with the new and old #41s on different types of papers. It would certainly have been more scientific to test them in the same type of pen, but all my pens were inked up already. I had my old #41 in a Lamy Safari with an Extra Fine nib. The new Noodlers #41 went into a Sheaffer 100 with a Fine nib. Still, I think I found out everything I need to know except for how the new one will do on lightfastness tests, and that will take awhile. As you can see above, the new formulation hardly bled at all, even when scrubbing with the wet brush. The old formulation displayed the one characteristic that has always bugged me about this ink, and ran enough to easily contaminate watercolors used in conjunction with an ink drawing. Before I started jumping for joy and thinking I'd finally found a true waterproof brown ink to use with watercolors, I figured I'd better test drive it on some paper I might actually use for journal art. 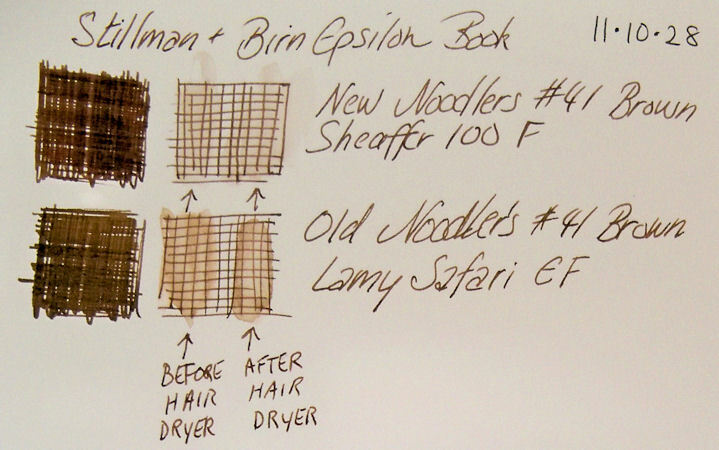 Below are samples of #41 New and #41 Old in a Stillman and Birn Epsilon book, made specifically for pen and ink. I let both samples sit for a few minutes, then scrubbed with the waterbrush on the left side of the crosshatched sections. Then I dried them with a hair dryer on high heat, let it cool, and tested the waterbrush on the right sides of the samples. As you can see below, both the old and new versions ran on this sized paper with the wet brush. However, the new #41 bled much less than it's older counterpart.Plus, the color that did wash out was much more neutral, rather than the more orange hue from the old version. I don't usually scrub so hard when working with watercolor over ink. Generally it's just one or two passes with the brush. I decided to try on one more paper and see what happened with just a single pass over the dried ink with the brush, as well as with scrubbing. For this I used a Stillman and Birn Alpha book, to see how they would act on a slightly more textured, sized paper. The ink was dried with a hair dryer before using a wet brush on it. I ran the wet brush down the left side of each of the crosshatched sections and also the more densely colored squares. Then I scrubbed with it on the right sides of each. Again, the new Noodler's #41 Brown outperformed the old. 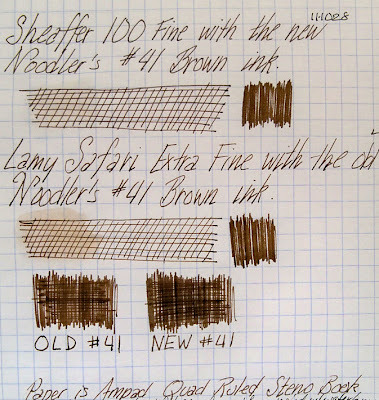 In fact, the single pass with the waterbrush on the crosshatched sample of the new ink didn't bleed at all. 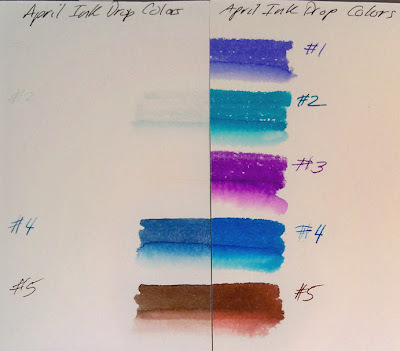 Are the two inks exactly the same color? No. When viewed side by side, you can see differences, but you probably wouldn't notice those color shifts without the direct comparison. Tomorrow: Some comparisons of "waterproof" blacks! These are the last sheets of my lightfastness tests for now. I'll be putting these back into the window to see how they fare over the next six months, and will give you an update then. I'll also be setting up testing for an additional 30 or so colors, which I will add to the window next week. Pretty soon, I won't be able to see out of my window! LOL I should have some preliminary results from those in a month or so. It amazes me that fountain pen ink can begin to fade in such a short time, but it does! Here is the list for the colors tested in this post. You can click the images to see larger versions. The left sides were exposed to sunlight in my window since last April. The right sides were kept inside a box in a cabinet. I was surprised that the browns above didn't fade and/or shift more than they did. However, they all changed enough to avoid awarding gold stars to any of them. 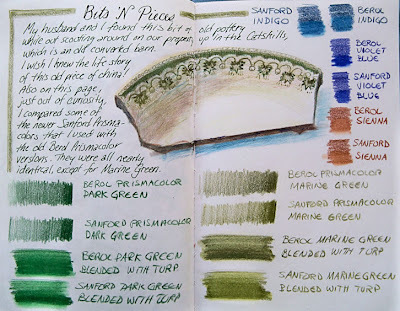 I still plan to use my favorites (like Caran D'Ache Grand Canyon) in my sketchbooks. But check these out! J. Herbin Eclat de Saphir (#1), Diamine Marine (#2), and Diamine Majestic Purple (#3) vanished so quickly that they should be in a magic show! It is worth noting that the sheets on the right, which were kept in darkness, have had no problem with retaining vivid colors, so please don't get nervous if you've been using these inks inside a book. They should be absolutely fine! These tests only reveal what happens when an ink is exposed to sunlight. If the inks you've used are not exposed to light, then these results are irrelevant. If you'd like to see the previous lightfastness tests, click here. You'll always be able to find them easily by clicking on the "Lightfastness Tests" category on the left sidebar. I have a bunch of wonderful new pens and new inks to review coming up in the next few days, along with a new drawing project I'm starting. So much to sketch, so much to sketch with, so much to photograph and share, and so little time! The left halves of these test sheets were in my south-facing studio window since April. The right halves were kept in a closed box in a cabinet. It is worth noting that the sheets on the right, which were kept in darkness, have had no problem with retaining vivid colors, so please don't get nervous if you've been using these inks inside a book. They should be absolutely fine! These tests only reveal what happens when an ink is exposed to sunlight. If the inks you've used are not exposed to light, then these results are irrelevant. 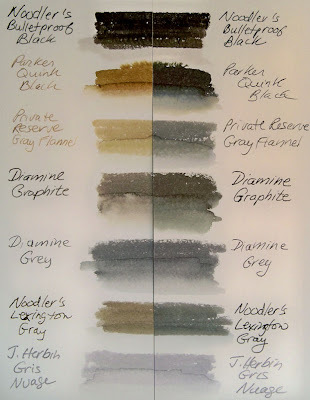 I found it interesting that so many of the greenish grays lost some of their blue component, resulting in a yellowish-olive/umber tone, like Parker Quink Black, Private Reserve Gray Flannel, and Noodler's Lexington Gray. Diamine Graphite turned from a greenish gray to a more neutral gray. 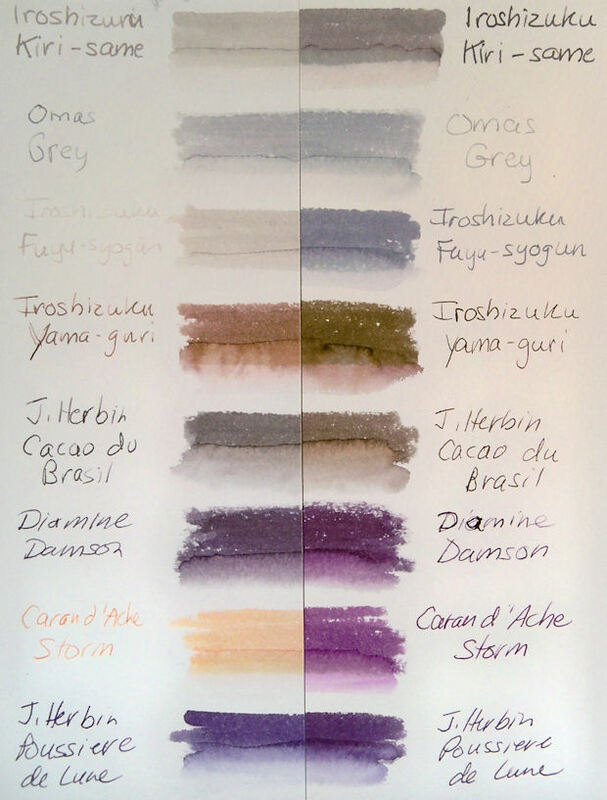 Iroshizuku Yama-guri (one of my personal favorite inks) lost some of the cool color, transitioning to a much pinker color, whereas Diamine Damson lost some of its rosy glow and turned to a bluer, cooler violet. And who would have guessed that Caran D'Ache Storm would bleach out to pale orange? Stay tuned for more lightfastness results tomorrow on 11 additional colors. To see previous lightfastness test results, click here. You'll always be able to find them easily by clicking "Lightfastness tests" on the left sidebar. You can click that image to see a larger version. The left side was in my south-facing studio window. The right side was kept inside a box in a cabinet, to avoid light exposure completely. 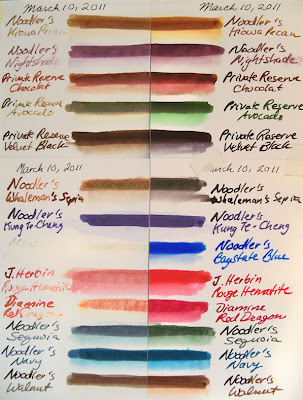 The biggest surprise was that Noodler's Baystate Blue completely disappeared! Well, okay, there are a few greenish bits barely visible here and there, but I'll bet within a month, those will be gone too. The other big surprise is actually a good thing; Noodler's Kung Te-Cheng, one of my favorite inks to work with, has stayed exactly the same as far as I can tell. That doesn't mean I'd do fine art with it to hang on my wall, but it does mean I feel totally comfortable with using it in my sketchbooks and for other purposes too. All the rest of these colors either faded dramatically, had large color shifts, or both. It's a well known fact that fountain pen inks should not be used for fine art. They are dye-based, rather than being pigment-based like paints, and those dyes are fugitive and not meant to withstand the long term effects of ultraviolet light. Still, some hold up much better than others. Even for use in my sketchbooks, I like to know where they stand. It is worth noting that the sheets on the right, which were kept in darkness, have had no problem with retaining vivid colors, so please don't get nervous if you've been using these inks inside a book. They should be absolutely fine! These tests only reveal what happens when an ink is exposed to sunlight. If the inks you've used are not exposed to light, then these results are irrelevant. Today I went to sketch with my friend Virginia along the Hudson River at the Newburgh Waterfront. 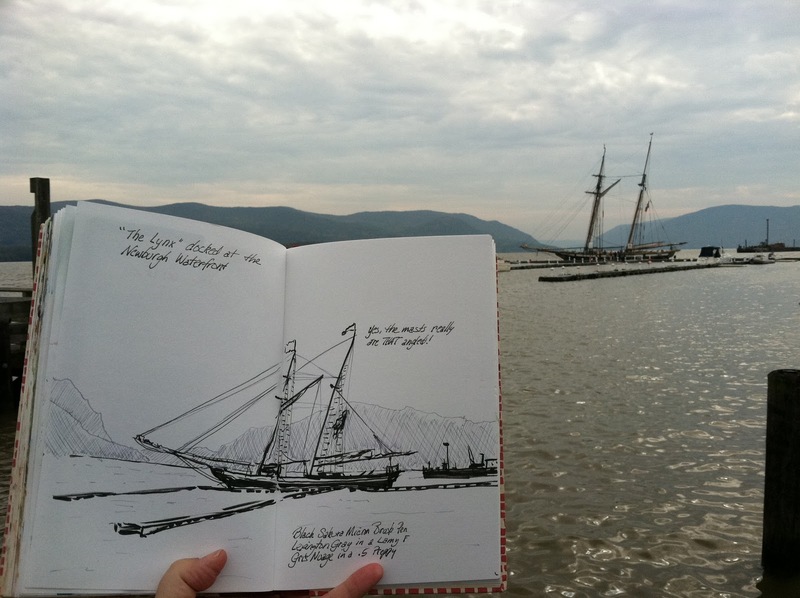 My plan was to sketch the cafes along the boardwalk and views of the Hudson Highlands. I was pleasantly surprised to find this gorgeous ship, Lynx, docked there to model for me. The angle of the masts is really striking. As usual, I didn't remember to get a photo while at my sketching location, but I got this one later from closer to my car, so the angle is a bit different. Still, you can get an idea of the beautiful scene there. I thought probably nobody would believe the angle of the masts without a photo! It's amazing how slanted they are. The sketch of the ship and docks was done directly with ink and a black Sakura brush pen. Then I used Noodler's Lexington Gray in a Lami Safari "F" for the rigging, and a Platinum Preppy 0.5 filled with J. Herbin Gris Nuage for the mountains in the background. Even when working in monochrome, it's nice to have some value options at your disposal! I was especially glad to have the Gris Nuage along for those soft mountains in the distance, made even softer today by the atmospheric conditions. Using the light gray ink for the mountains allowed the ship stand out in the foreground, while providing a nice backdrop shape. Every so often, I find a little something special when out walking. These glass bottles and turkey feather I found while walking the dog. The bottles will make nice wildflower vases come spring. The wide-mouthed one will serve as a brush holder in the meantime. I have an old pitcher that I've been filling with turkey feathers whenever I find a nice one. This particular feather is very downy --- as if it belonged to a young bird. These were all painted with watercolors and Escoda round sable brushes sizes 10 and 2. The writing was done with Noodler's La Reine Mauve (in their "Eternal Inks") line, using a Platinum Preppy eyedropper-converted fountain pen. I got this beautiful, new Schminke watercolor palette! It folds up nice and small, and is pretty easy to travel with. I decided that I wanted a setup with more colors that was still easy to cart around. It's a little larger than the palette I was using before, and I had to make a new sketchboard to accommodate the extra width. It came as a three row palette, but my husband trimmed a bit off the metal plate base so I could slide it up and squeeze in an additional row of half pans. 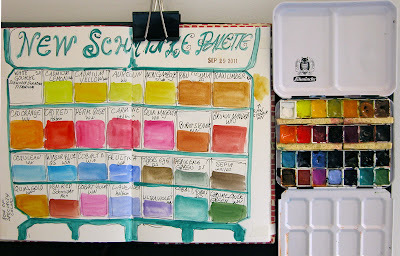 The painted color chart was done so that I'd be able to remember what was in the set in terms of both color and brand. Some colors are completely different in different brands. 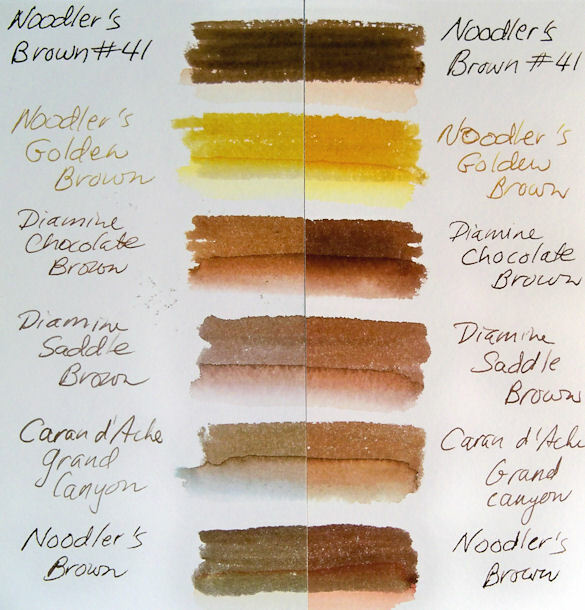 That seems to be especially true with Raw Sienna and Raw Umber! I realized that if I wanted my mixes to be consistent, I'd have to be consistent in brands too, or at least test drive mixes in advance when trying new brands, so I can avoid some surprises when out painting on location. 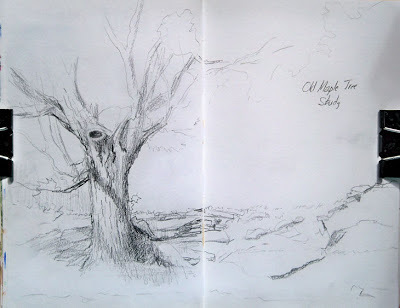 This was done out in my yard, using a 6B pencil in my Fabriano Venezia book. This old Maple has so much character from every angle. I did another drawing of it on Stonehenge, using a light and a dark on a colored ground. You can see that on this post on my Hudson Valley Painter website. Yesterday, I did yet another sketch of it from a different angle in watercolor. I'll be posting that one tomorrow on http://hudsonvalleypainter.com.